When it was last "protected", the previous owners opted to use paint on the horizontal boards and all the railings. Judging by the degree of peeling that occurred, I don't believed that they actually bothered to prepare the underlying surface at all, nor did they attempt to remove the lattice before painting; they simply tried to paint around it. 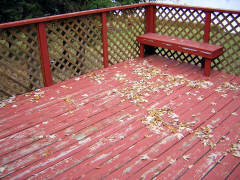 Much of the exposed wood also has a green tinge to it, likely some kind of mildew that will need to be treated before the deck is re-protected, or it will causes adhesion problems in the future. The physical integrity of the deck hasn't fared much better. Rumour has it that, when a less than scrupulous neighbour was completing the foundation of his own cottage, he opted to use three of the 6"x6" posts supporting the center of our deck. When the previous owners returned to find the deck hanging down like a great big wooden hammock, they choose the thriftier route of replacing the larger and more substantial pieces of lumber with 4"x4" posts. Fortunately, this hasn't resulted in complete structural failure yet, but it will need to be addressed eventually. I also suspect that the number of bolts holding the ledger to the cottage is less than it should be, but I'm not sure what to do about that. There are a few other issues that should be addressed as well. 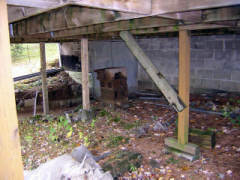 Although the outer ring of posts are properly supported by concrete piers, the three (now insufficiently sturdy) inner posts are precariously supported. One of them sits, semi-acceptably, on a precast floating pier block, but the other two are sitting on stacks of loose scraps of wood sitting directly on the ground. One of these posts also has a make-shift brace haphazardly nailed to one side of it. The proper thing to do here is to dig some deep holes, pour some proper piers, replace the replaced pilfered posts with (much more expensive) 6"x6" posts, and maybe even add proper bracing all around the outside (recommended for deck over six feet high). Shouldn't take too long, should it? Constructing a deck will be much easier once you are familiar with the correct terms for the various elements of a deck. Though there are some differences between attached decks and freestanding decks, for the most part the following elements remain the same.